The tragic story of Shakespeare’s Macbeth is well known: a terrible tale about the perils of ambition. So, to celebrate the 400th anniversary of the Bard’s death, the Dorset Opera Festival presents a new production of Verdi’s opera of the same name. Encouraged and abetted by his wife, Macbeth attempts to remove the various obstacles preventing him from becoming king. He accepts the prophecy of witches as a guide to what will be, and misjudges what they tell him. In the end, believing that he cannot be harmed when really he is just mortal like everyone else, his overconfidence leads to his downfall. 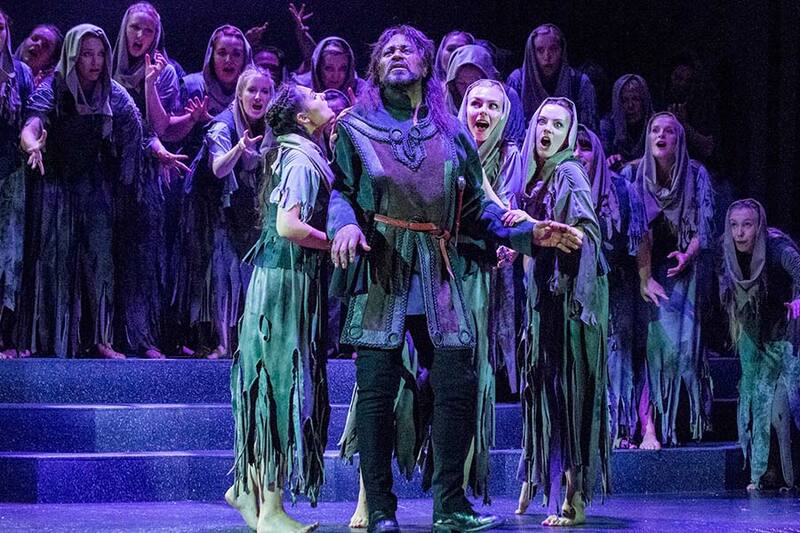 Macbeth contains some of Verdi’s most evocative writing including highly descriptive choruses, and show-stopping arias for Macbeth, Lady Macbeth, Macduff and Banquo. It was amazing, after supper, to hear the opening notes of Verdi’sMacbeth. Jeremy Carnall, Dorset Opera’s music director, made the orchestra sound like a different body, no doubt partly thanks to the contrasting scoring of Verdi, but also because of the thrilling precision he achieved and maintained, and the energy with which he infused every last player and singer. This, my favourite by far of Verdi’s early operas, received a performance in all respects worthy of an international opera house. 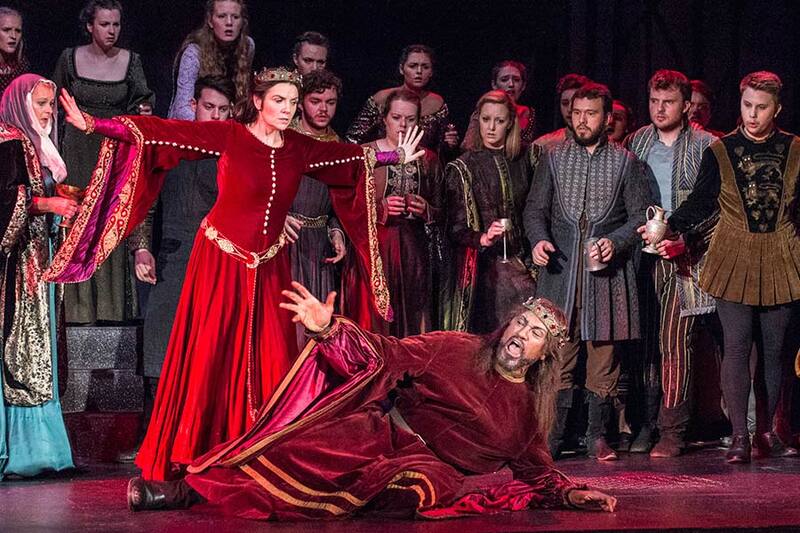 Macbeth, who in many performances seems less interesting than ‘Lady’, as Verdi called her, and has far fewer exciting things to sing, was taken by Mark S. Doss. I don’t know whether it’s more my fault or his, but he is new to me, and clearly a major artist. Whatever charisma is, he has it to spare, looks marvellous, acts powerfully and has the most impressive bass-baritone voice I have come across in years. He was Dorset’s Dutchman three years ago but I idiotically missed that. Since he is 59 and has sung everywhere, Dorset can congratulate itself on having him as the riveting central figure in this great work. His Lady was Lee Bisset, and anyone who has seen her Isolde and Sieglinde will know that she, too, is a superb artist. Most Ladys have been heavier-voiced than she, and no one could pretend that she sounded as terrible as Verdi indicated, but in some ways that made her, with her refined coloratura, more menacing. The casting throughout was strong, with Leonardo Capalbo making Macduff an engaging figure in the English scene, and Michael Druiett an exceptionally vivid presence as Banquo, though I regretted his non-appearance as a ghost. The witches were a fearsome crew, partly on account of their sheer number, partly for the huge relish with which they foretold Macbeth what he was up for or into: this variety of Fate scared me more than Tchaikovsky’s. A performance that I shan’t forget. 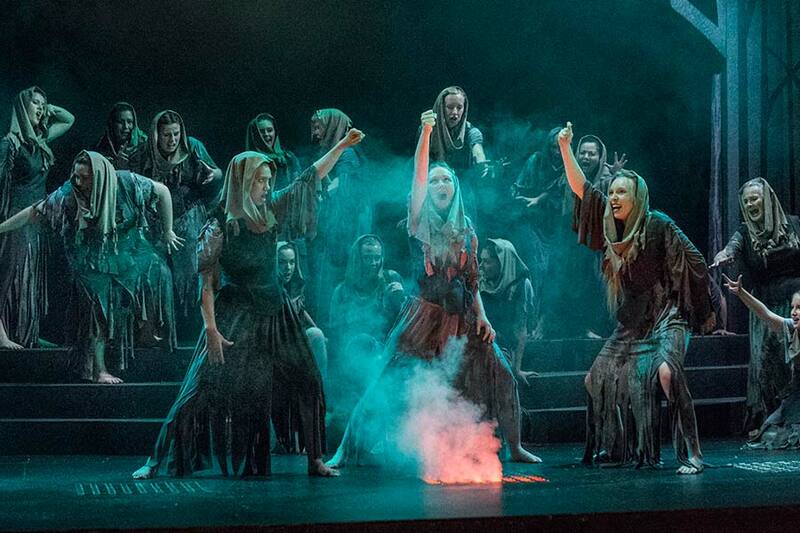 Dorset’s Macbeth was brilliantly sung, with a fine simple set and mostly highly effective lighting. And there was a palpable charge between the central characters, sung by Mark S Doss, who is now a firm favourite with DOF audiences, and the great soprano Lee Bissett. Doss was convincing from the start, a man who is secure in his military role but rattled by the witches’ prophesy and haunted by what he has done after the assassination of Duncan and even more after the murder of Banquo. By emphasising his internal torments – writ large on the baritone’s expressive face – there was no need for Banquo’s ghost at the banquet. We knew it was his own demons leering at him through the eerie red light of hell. Bissett drew on her huge experience as well as her gorgeous voice to make this a Lady Macbeth of epic proportions. Instantly aware of the promise of the witches’ words, she was a steely backbone to her worried husband before the murder of the king and a perfectly poised hostess for the banquet scene. So much strength and composure had to crack, as it does in the second act. I can’t imagine hearing Verdi’s exciting interpretation of Shakespeare’s tragedy better sung or characterised than it was here, with strong support from the Macduff of young tenor Leonardo Capalbo (another firm DOF favourite after his star turn in L’Elisir d’Amore last year). Among many intelligent and insightful ideas of the director, I particularly liked the inclusion of Macduff’s family in the big banqueting scene. In most productions, of both play and opera, we don’t see Lady Macduff until the murder scene. Seeing them as a family, and his evident love of them, hugely intensifies the horror of the massacre to come. 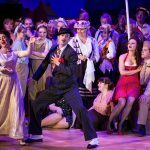 The Dorset Opera chorus is one of the jewels of this rural festival. 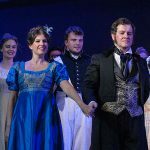 The singers have a two week residency rehearsing for the two operas (this year’s other work was Tchaikovsky’s Eugene Onegin – see review below). 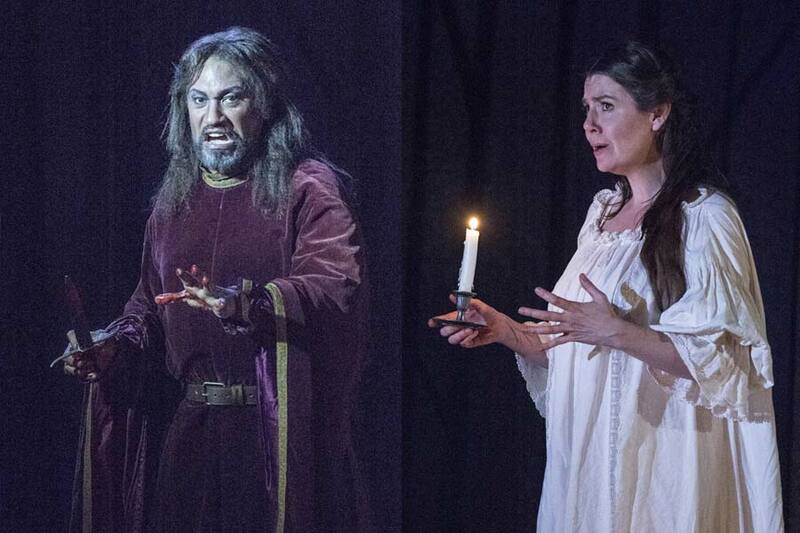 But the sheer size of the chorus was also a problem at some points in Macbeth – too many witches, too many murderers. “When shall we three meet again?” loses some of its power when it’s more like 33, but they sang beautifully, and the effect was certainly weird, just less frightening than it should have been. It is hard to imagine how Banquo would not have heard the 20-plus assassins stalking him, or how Fleance could have escaped so many armed thugs. The lighting was also a let-down in this scene – Banquo is singing of darkness and shadows and it was all a bit too light. 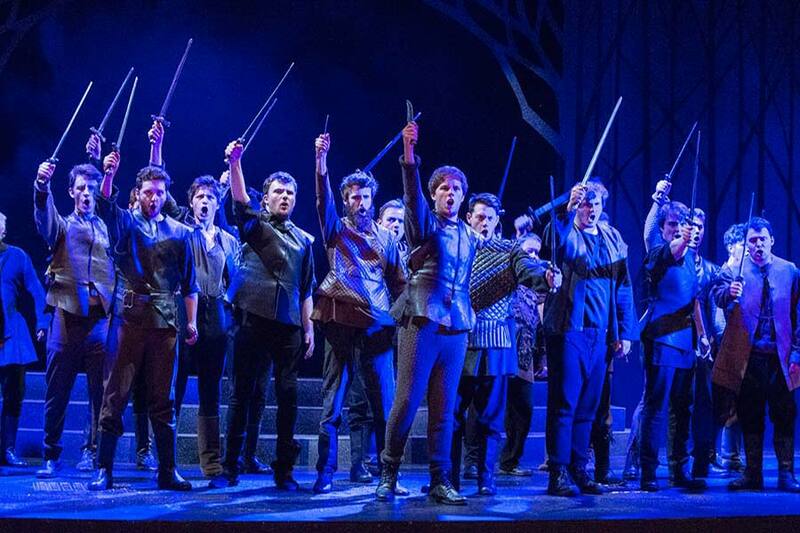 However much we understand the need to give the chorus plenty to do, there are hard artistic choices that sometimes have to be made and this was the case with Banquo’s murder. The chorus was wonderfully used in the banqueting scene, which so often is sparsely populated, detracting from the pomp and power of the Macbeths’ doomed coronation. The effect of the king’s ‘fits’ is intensified when seen on the faces of a large and increasingly frightened gathering. This was a powerfully sung and acted Macbeth, a timeless tragedy of ruthless ambition and the tricks that Fate plays on its victims.